With a 7,200 RPM rotational speed, the Seagate ST3160021A hard drive provides exceptional transfer performance. You can easily store all your media and data files in the decent storage capacity of this Seagate internal HDD. The 2 MB buffer of this Seagate hard drive allows you to access your files and data at a faster rate. The 3D Defense system of this Seagate internal HDD protects your data from any damage. The SMART feature of this Seagate hard drive identifies any faults in the drive and ensures reliability. The Seagate ST3160021A hard drive has an Ultra ATA/100 interface that ensures easy connectivity with your PC. Works very well for me two! Great IDE/PATA Drive for the money. 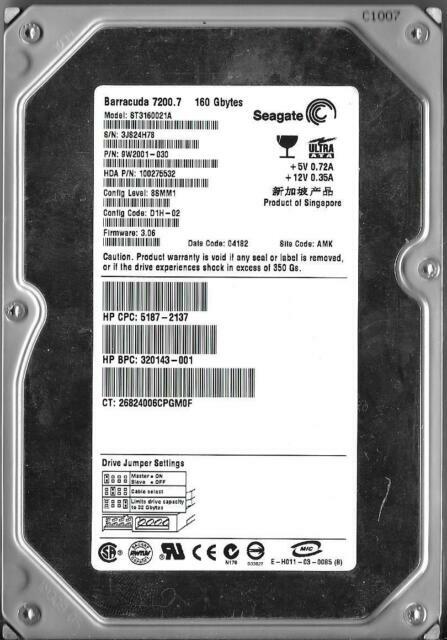 Very reliable hard drive,and the price was great! This is a great Drive for anyone who wants to upgrade their system,or just use for extra storage,very reliable!